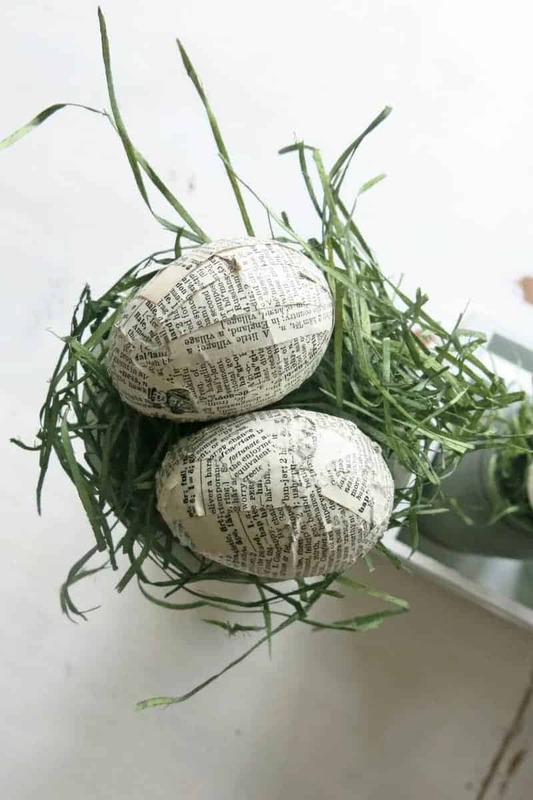 Learn how to upcycle plastic Easter eggs with vintage pages. 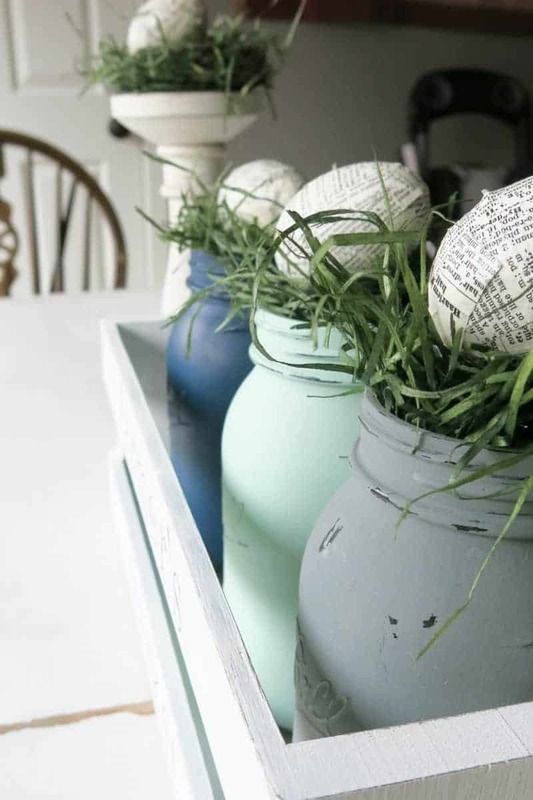 This simple Easter craft will allow you to create Spring decor that fits right into your farmhouse style. 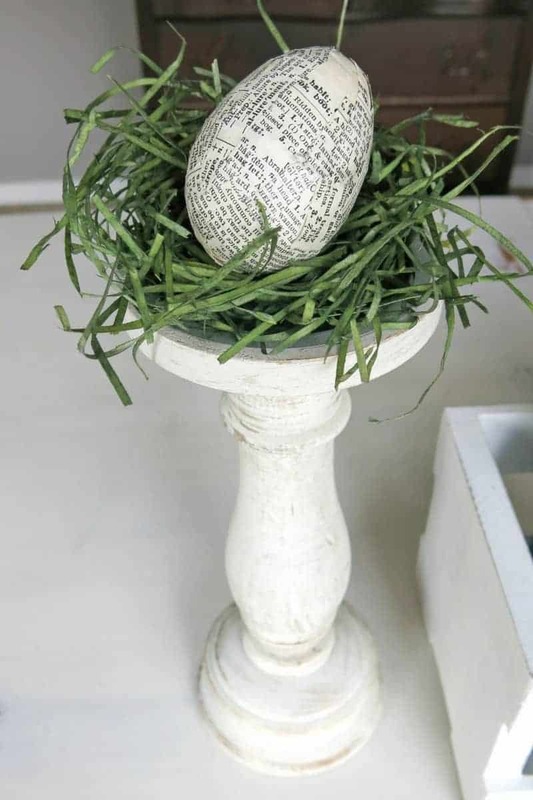 Be sure to check out the cute farmhouse style Easter centerpiece that the end too! Fun fact: I was born on Easter morning …AND I had a bunny collection/obsession growing up. Needless to say, Easter is probably one of my favorite holidays! 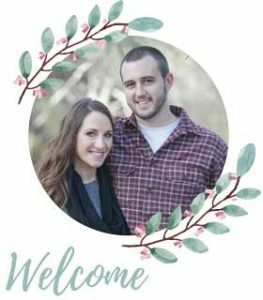 I mentioned last week that sometimes decorating your home seasonally can feel like a hassle, but it doesn’t have to be. I mean, seriously how easy was that farmer’s market farmhouse crate centerpiece we made just in time for the first week of Spring? 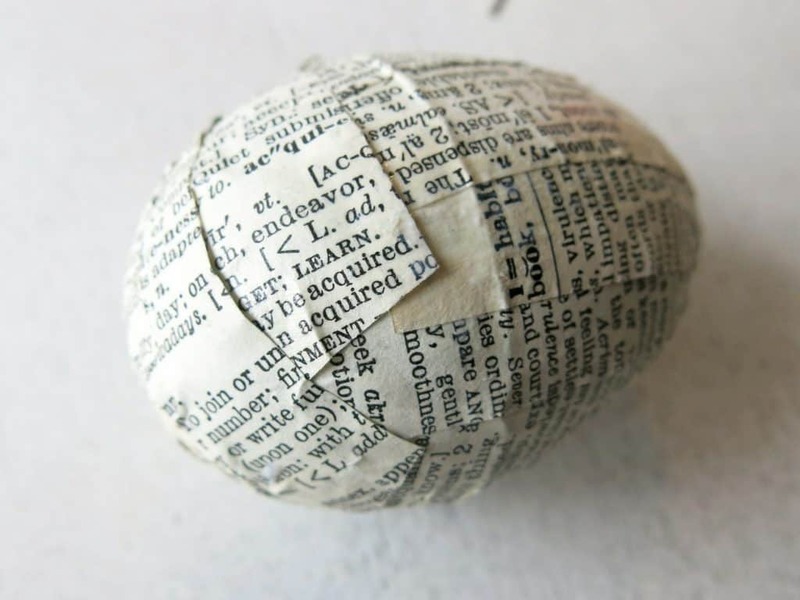 Today we’re going to learn how to upcycle plastic Easter eggs using vintage book pages. 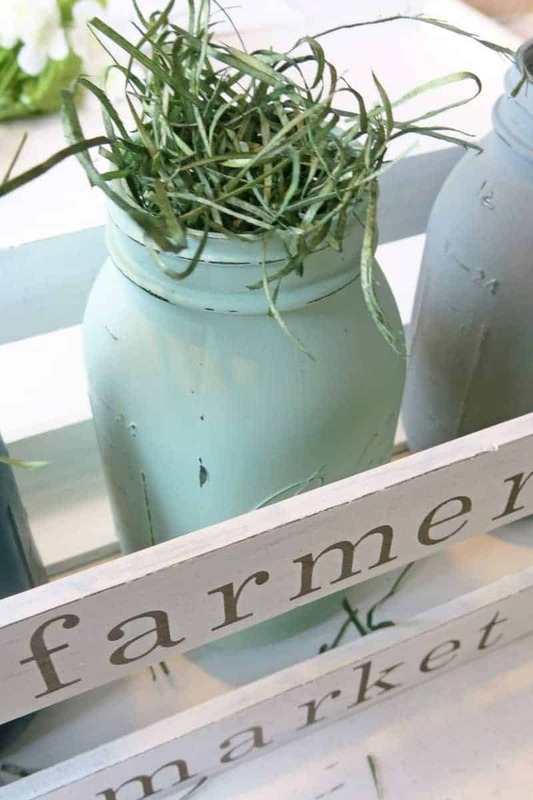 At the end, I’ll show you how to change that fun farmer’s market crate centerpiece from Spring to Easter in a matter of minutes. 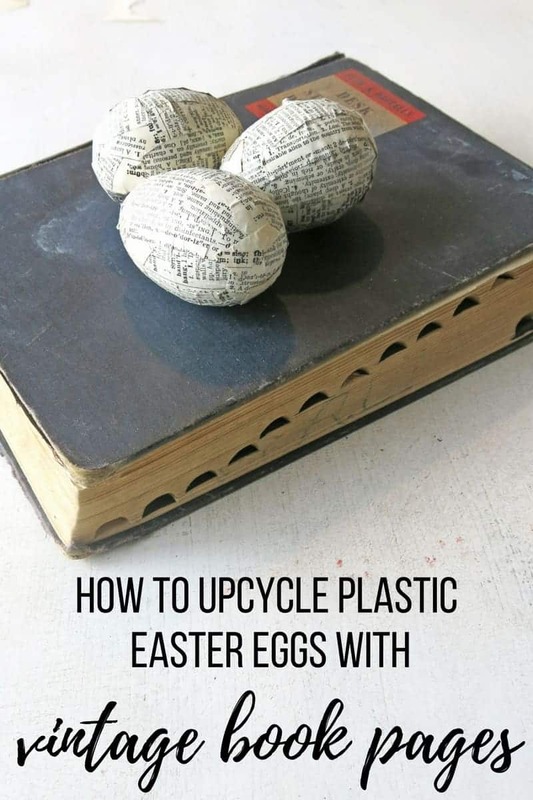 This guide on how to upcycle plastic Easter eggs contains affiliate links, but nothing that I wouldn’t wholeheartedly recommend anyway! Read my full disclosure here. Step 1. 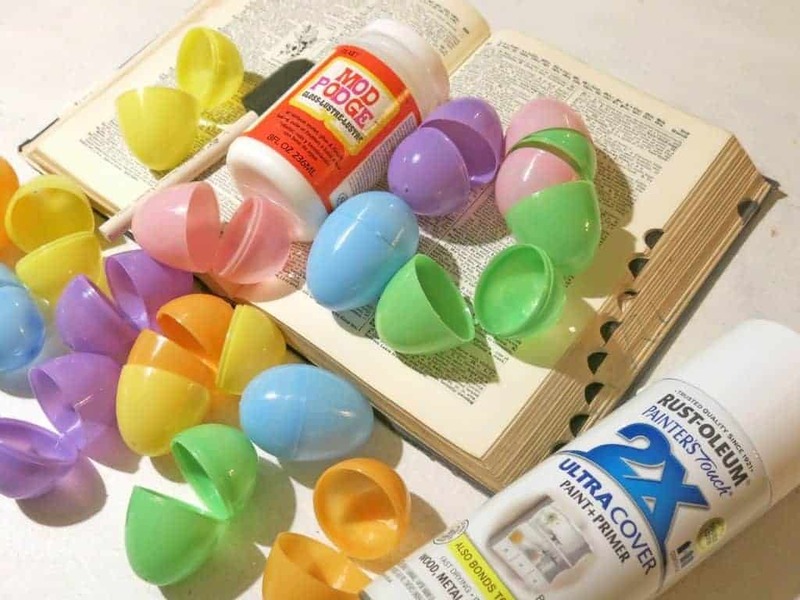 Paint plastic Easter eggs. This step may seem kinda silly. Why would you paint the eggs if you’re just going to paint over them? Well, I was worried about the bright colors showing through the paper, especially vintage book pages which are typically thinner. The vintage dictionary pages I ended up using were actually thicker than I thought would be. So, just use your best judgement to determine if you need to do this step depending on the paper you’ll be using. Step 2. 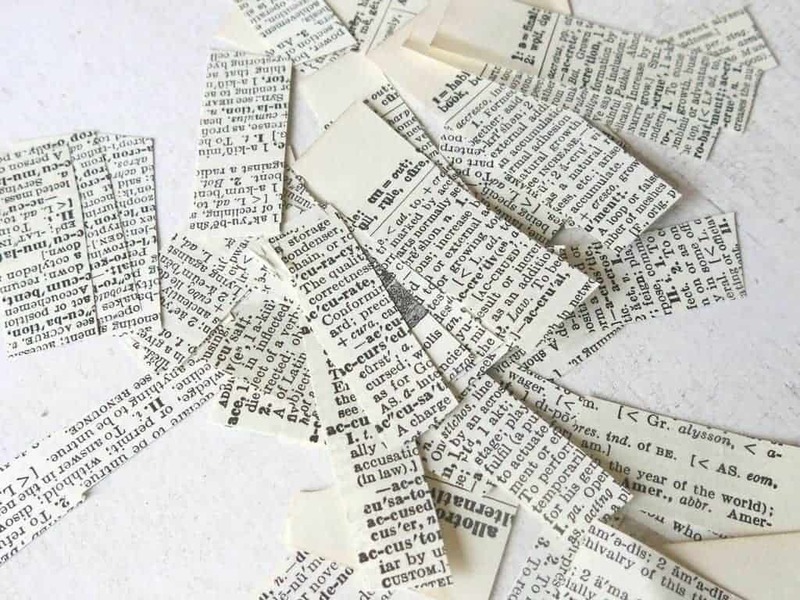 Cut up vintage book pages. You will probably only need a page or two for you eggs. I cut up strips about a half inch wide and then cut them on about 1-2 inch pieces. You will also need some smaller little pieces for filling in gaps and the top and bottom of the eggs. Step 3. Decoupage the vintage book pages. I tried a few different methods for this. I found that the best and most clean way to do this is to coat a thin layer of mod podge on the back side of the piece of paper. 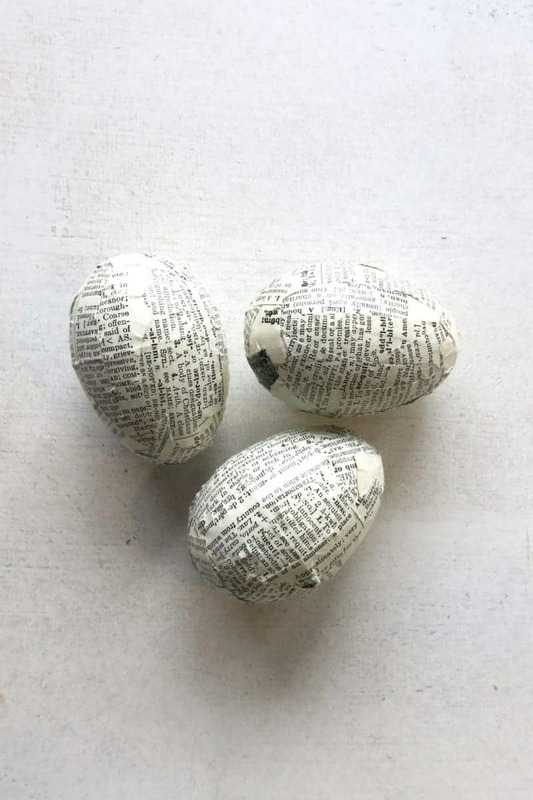 Then, you just press the paper onto the egg with the mod podge side down. You may get a few ripples on the paper as it bends around the eggs. Just smooth them out the best you can. Step 4. 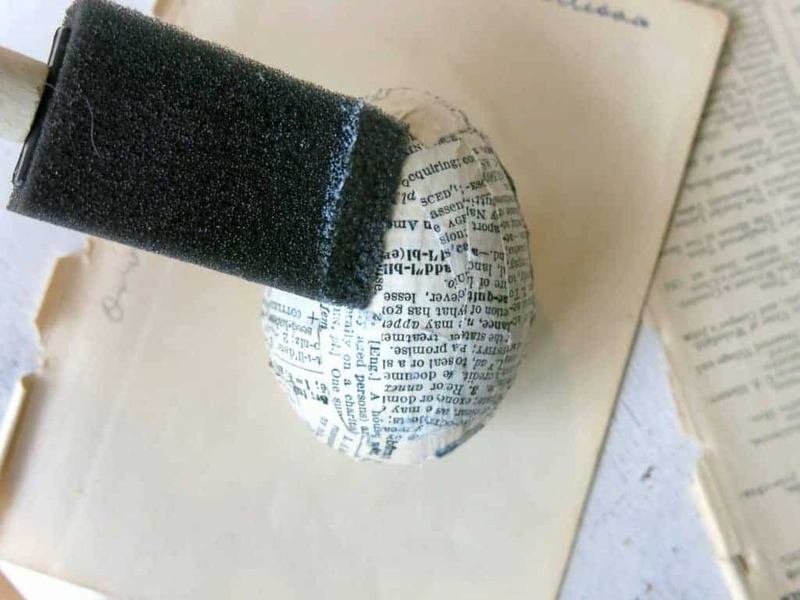 Continue adding vintage book pages to eggs. 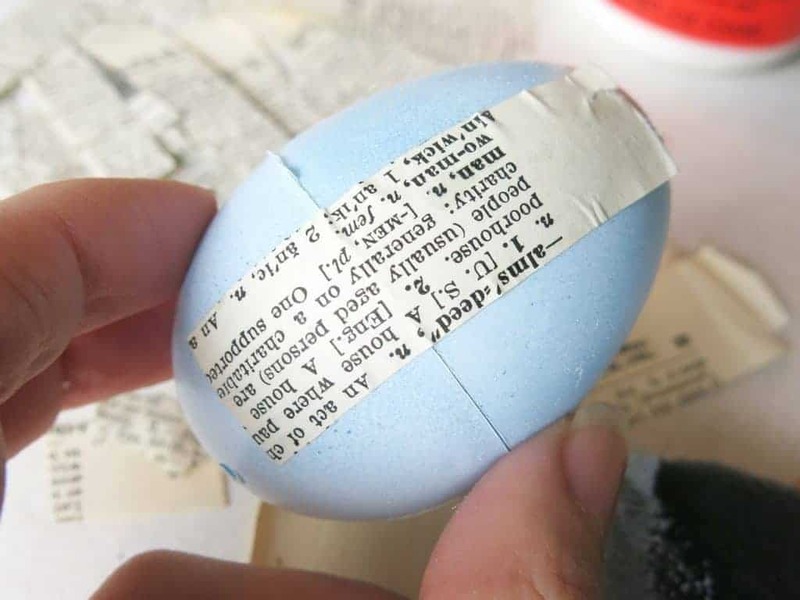 As you get up to the top and bottom of the egg, it works best to use smaller pieces of paper instead of the strips. I usually ripped a few of the strips in half for this part. 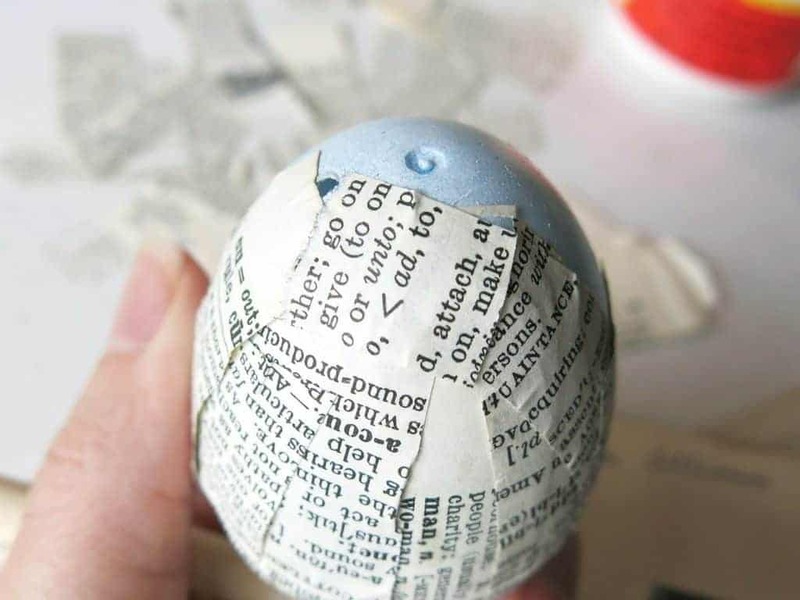 Continue to add the paper until the entire egg is covered. Step 5. Apply a light coat of mod podge. The key here adding a VERY light coat of mod podge over the egg and focusing mostly on the edges of the paper. The vintage book pages can be fragile, so just be careful on this step and keep it light. Also, I would recommend avoiding handling the egg a lot when you’re applying the mod podge. I found that some of the print was coming off onto my fingers the more that I moved the egg around. Are you still thinking that decorating for the seasons is a hassle? Looking for a quick Easter centerpiece? 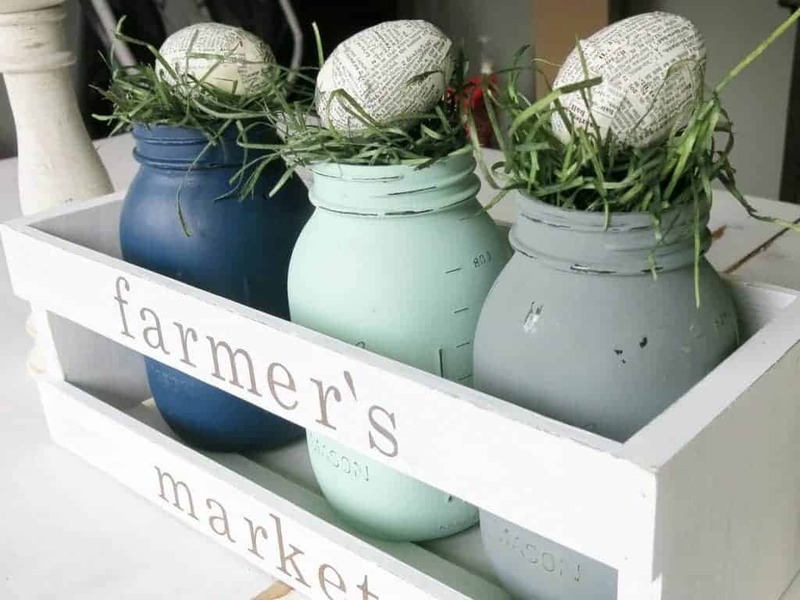 Another way you can use the upcycle plastic Easter eggs is to pair with the farmer’s market farmhouse crate centerpiece and painted mason jars. I picked up some of this fun stuff at the Dollar Tree and…..
….threw a little bit on the top of the painted mason jars to make a mini nest. 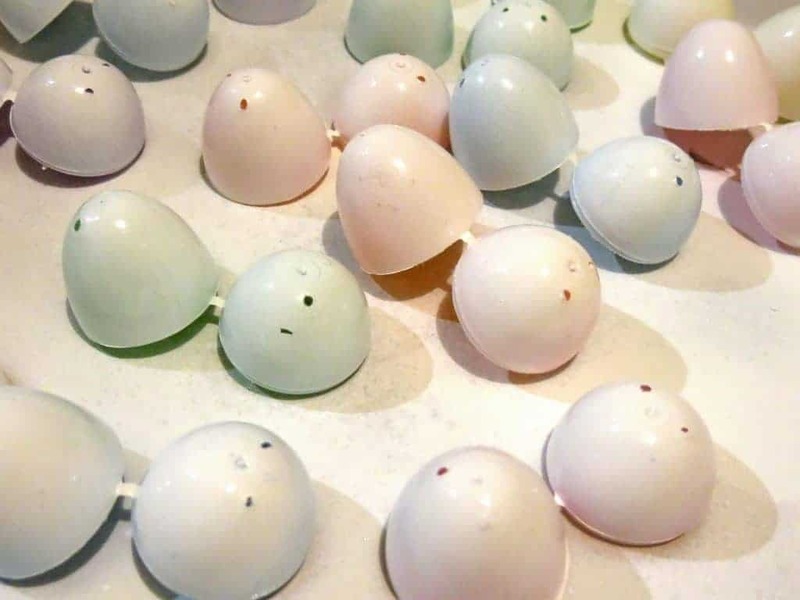 I topped the mini nests with one of the upcycle plastic Easter eggs and TA DA! Isn’t that the cutest little Easter centerpiece?! This same little trick works on top of candlesticks too. I love the fresh and clean look of this Easter centerpiece. It only took me a matter of minutes to switch out the faux flowers in the mason jars and add the cute mini nests on top of mason jars. 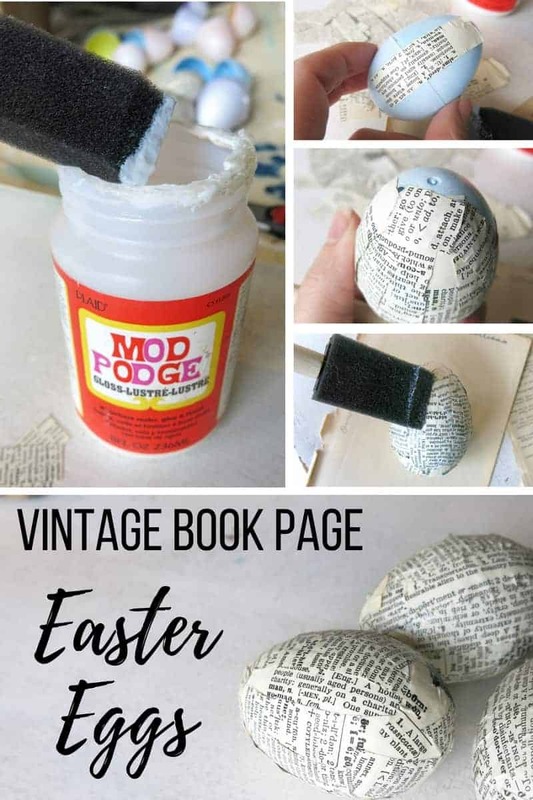 I had to come over and visit your blog to see your vintage book page eggs. They turned out lovely!. I have tons of old books for doing the same type of thing.